“Nashville music star and family man, Cole Michaels, is persuaded to embrace an “American Dream” Theology that promises comfort, happiness, and success. But when the unimaginable happens, Cole blames God and abandons his faith. More vulnerable than ever, he is clueless that an evil character with an unspeakable secret is using every available resource to find him. Down every forgotten road is a new discovery. Sometimes pleasant. Sometimes frightening. 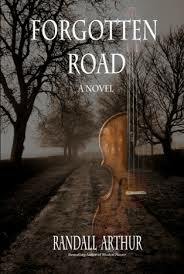 Forgotten Road by Randall Arthur is the first book that I have read by this author and it is unlikely that it will be the last. It is one of the best books I’ve read in a very long time. It is at times sweet and other times rife with raw gut-wrenching emotion. This book will grab you on page one, touch your heart, jangle your emotions, and not let go of you until the last paragraph. It is filled with Cole Michaels’ personal road to really discovering the truth who God is and how to humble himself not only before God, but before man as well to let HIS light shine through. I can’t say enough about this book… but to divulge too much would give away the story. You must unwrap this story yourself. I will warn that there are a few paragraphs/pages that are seriously graphic – so sensitive readers be aware.